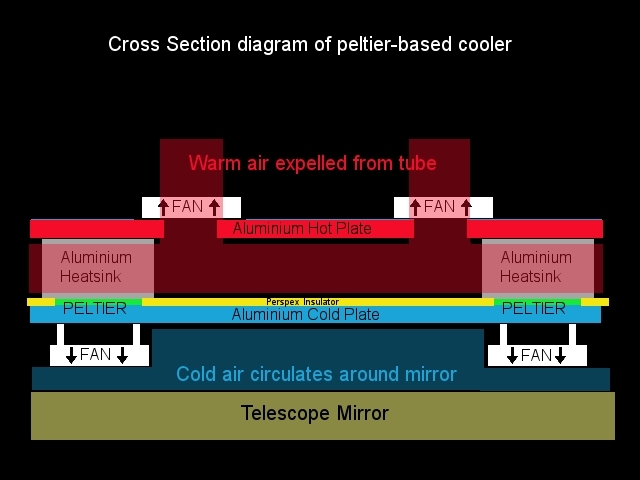 This article describes the design and construction of a cooling system for newtonian telescopes. The cooling system comprises three peltier effect heat pumps, some aluminium plates and fans. This is version 3 of my cooling system. You can see articles which describe versions 1 and 2 here. I designed this cooling unit to suit a 13.1" conical newtonian mirror. If you haven't heard or seen conical mirrors before, have a look on the R.F. Royce website. My conical mirror didn't come from Royce, but it is identical in design to the conical mirrors that he is promoting and using. As you can see by the information on his website, a conical mirror has several advantages over a classic "thick" mirror - it is lighter, meaning less glass to cool, and also there is a cavity between the mirror and its mounting plate for items such as fans to circulate the air. The mounting arrangement is different as well - no flotation points are needed, rather a simple hub-mounted design is good enough as the mirror has most of its mass concentrated near the centre and so doesn't require edge supports to keep its shape. My mirror is being made by Mark Suchting of Deep Sky Optics in Berowra. He ground and polished my current 10" mirror which has been used to capture almost all of the planetary images on my site, and I'm expecting the 13" to be of equally high quality. This design integrates the mirror cell and cooling into a single unit. This is a big difference to my previous designs which were separate to the mirror cell. In this case I had the opportunity to integrate these functions as I was building this scope from scratch. A cold plate containing the mounting stud for the mirror. 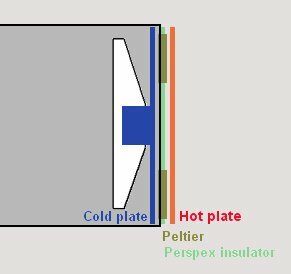 An insulator (perspex) to separate the hot and cold sides, and also add support to the mirror cell. A hot plate with heatsinks and fans to dissipate the heat. There are 3 small fans mounted inside the mirror cell, between the mirror and the cold plate. These fans are used to circulate the air around the mirror to break up boundary layers and make the cooling more efficient. There are three larger fans mounted on the hot plate at the rear of the cell to extract hot air from between the hot plate and the perspex insulator. The mirror cell attached to a metal ring that is bolted to the inside of the tube. Three plastic knobs (triangular) are used to adjust the tilt of the cell for collimation. Nylon bolts are used throughout to keep the hot side from conducting any heat back through to the cold side.